Hi, my name is Victoria Atencio and I am 21 years old, from Santo Domingo and San Juan Pueblo. I am a Junior at New Mexico State University studying Wildlife Ecology. Every year since my freshmen year in high school, I have participated in the Tribal Youth Environmental Summer Camp (TYESC) that is hosted by Eight Northern Indian Pueblos Council (ENIPC-OETA). This camp teaches students about aspects of the environment such as geology, soil science, water quality monitoring, plants, and GIS/GPS techniques that are used in the professional field of various science related careers. As part of the camp, professionals from these fields come out to teach students these techniques and methods and that is how I found out about River Source. I was always fascinated by the work that River Source did with restoration of watersheds, testing water quality with the use of Benthic Macro-Invertebrates monitoring, and offering internships to students who have an interest in this field. And I am now, honored to say that I have been given this incredible opportunity to work with River Source has an intern. Within my internship thus far, we have already done so much. Our first week of the internship, we participated with the TYESC camp in Taos Pueblo at the Hot Springs. Since I have participated in this camp in previous years, I was asked to be a student mentor and help out the staff. Every day we did something new with the students teaching them geology, emergency response, water quality techniques, fish shocking, and traditional ecology. It was a great opportunity to get hands on experience from professionals in the field, the type of work that they do, and how it relates to everyday life. 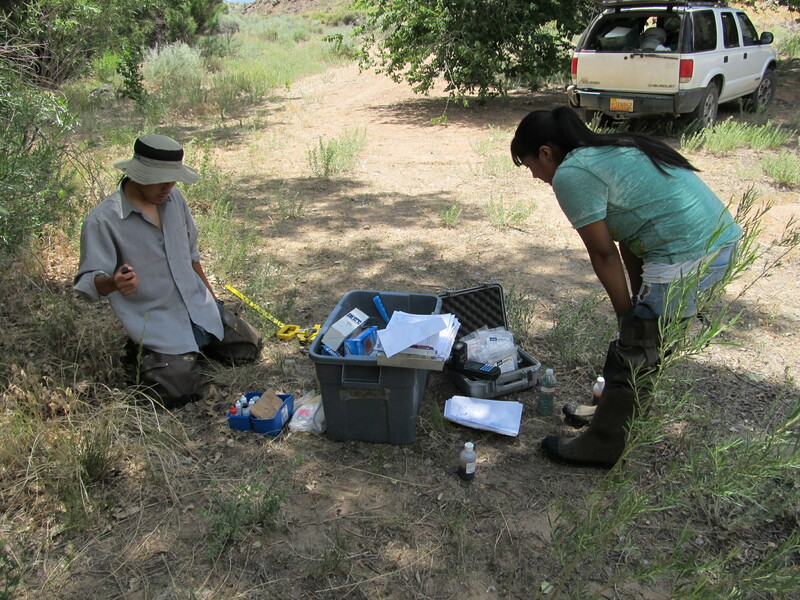 The second and third week of our internship we were mainly focused in on working with Cochiti Pueblo. We have done a lot of work along the Santa Fe River such as water quality that involves techniques such as collecting data of the pH, TDS (Total Dissolved Oxygen), Turbidity, Dissolved Oxygen, Stream Flow, and Benthos-Macro Invertebrates. We have also been studying fluvial geomorphology, which is looking at how the river flows, where it flows, at what elevations, where the stream structures change, etc. We use this information to understand the structure of the river and if we were to do any form of restoration to the river, we would have an idea of what types of methods we can use such as installing cross veins, rock dams, and Zuni bowls, etc. We have also been using the geomorphology and water quality techniques to look at conditions at Cochiti Canyon to get an insight to the structure and state of the stream after the devastating Las Conchas fire and flooding that occurred in past years. It has been an interesting and educational past couple of weeks that I have been working with River Source, and I look forward to the rest of the internship. Not only am I learning about this field, but I also feel that I am also making a difference for the Pueblo of Cochiti by collecting data about their landscapes, GPSing where the locations are, and use ArcGis to graph and plot maps enable to one day show the community of Cochiti what work we have done on their land. This internship experience has been impeccable. As I work with Cochiti, I can slowly see a glimpse of where I want to be in my future career. After I receive my degree in Wildlife, I plan to work for a tribal community as well; to provide/help the people with environmental issues that they face and share that cultural stability with nature.